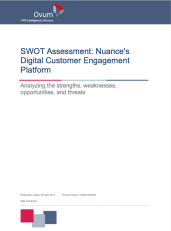 "Nuance's capabilities stand out in a rising sea of AI platforms” based on the October 2017 SWOT analysis from Ovum." Intelligent virtual assistants engage with your customers for the immediate response they expect. Seamless escalations to human agents ensure your customers get the answer they are looking for in case the virtual assistant doesn’t know it. Artificial Intelligence for smart targeting and routing mechanisms enable you to engage with the right consumer using the right engagement at the right time. "Nuance’s technology has the differentiated ability to understand and predict customer intent and then deliver the messaging with context across any preferred channel, including web, mobile, messaging apps, SMS, and IoT devices such as the Amazon Echo," said Mila D’Antonio, Principal Analyst, Ovum. Download the report to read Ovum’s assessment in full.